What comes in your mind when your kids need a room where they do there paperwork, completing their tasks on computer, store the stuff they bring from the school, do research and bring their project to the end?Now as they back to home from the school, definitely they are required for a study room. Following are the 5 amazing ideas for an appealing and lovely kids study room in your home. There is need of great consideration when it comes to study floor. You must keep in mind that your floor of the study room would be like the floor of rest of your home. Wood would be a classic choice, as it comes in several hues designs and easy to keep clean.If you want flooring which is easy to clean then there are such types of floor like Satin or Gloss finish, it hide the dirt better. Other many types of wood flooring are there like maple, ash, pine and other. And if you want warm and comfortable flooring then use the carpet flooring but note it is hard to clean the carpet flooring. When it comes to storage, don’t forget to make a large space for the storage of files, folders and all other paperwork and stuff. You should have enough space for the storage of that. Apart from that, designing should be of the kid’s tastes and according to their age group requirements. For sitting provide them with desk each or another option is to supply an open desk for group study. For alternatives you can place beanbags in the roomat the same time. For making their full of comfort and cozy, you have to choose the furniture which provide with these qualities. Make place for the armchair near the bookshelf for reading and give them the homely feel. Make the place for time to time changing of equipment according to their need. As the want the newest technology for learning, make the room for computer and other necessities. If you fortune enough to have large windows and doors in you study then utilize it in its full capacity. But on the other hand if not then make the lightening for your home of high quality which does not strain your kid’s eyes while working. Select the curtains and pale which make the feel of brightness in the daylight hours. Alternatively you can go for lamps and other artificial lightening material along with blinds which give a formal look. 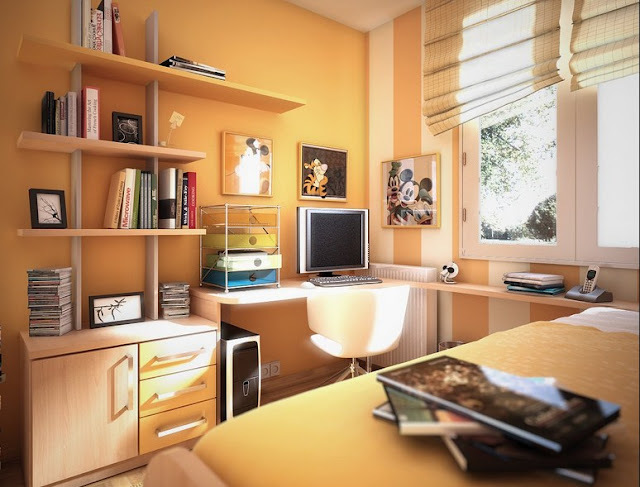 The color of study room would have a great effect on your mental ability to work on, so let the room paint with the colors which suits moods and the study environment. Light colors can have a better impact on the stress level of kids while studying, smooth and calm shades would be at the preference. Decorative objective like stickers gives a nicer look but may create hinder in concentrating that’s why clean your surface with the things which aren’t essential. A study should not to be a boring place yet it must contain the things which make kids for effective learning and helps to fully concentrate on their studies.